With over one million data records to process and filter, the client found it increasingly challenging to accurately track and report their use of conflict minerals to customers. 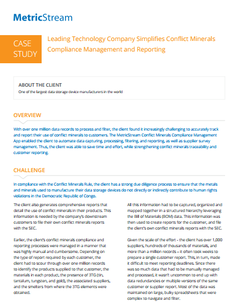 The MetricStream Conflict Minerals Compliance Management App enabled the client to automate data capturing, processing, filtering, and reporting, as well as supplier survey management. Thus, the client was able to save time and effort, while strengthening conflict minerals traceability and customer reporting.